We’ve hosted our share of Thanksgiving meals, and this year we’re ready for an alternative take on tradition. When you build your own menu, from protein to starches to pastry, Thanksgiving becomes more dinner party than potluck. You’re free to choose dishes that complement one another, without worrying about your aunt’s signature casserole. This week, we’re batching a Salty Dog cocktail. 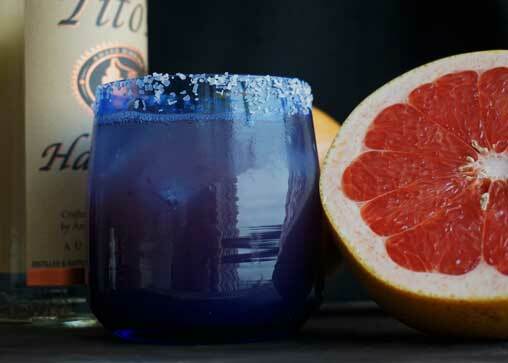 This is a great holiday party drink: You don’t have to mix drinks all night, grapefruit is in season, and the salt on the edge of the glass looks like ice by moonlight. Win-win-win. Mix 1 part vodka with 2 parts fresh grapefruit juice and refrigerate. Pre-salt glasses using lemon juice and salt. To serve, pour cocktail over ice and garnish with a lemon wedge. Cocktails for Two: Holiday Bundle. Holiday special: $325! A handcrafted way to enjoy a nightcap with your favorite drinking buddy all year long. This season we’re offering a special theme gift, for the drinks enthusiast in the family: our Cocktail Holiday Bundle at a 34% savings!